These can be gluten-free. Just use a GF baking mix in place of flour, baking powder, and baking soda. Mix dry ingredients in bowl. Whisk egg, milk, yogurt, pumpkin until there are no lumps. Mix with dry ingredients only until mixed. Cook on hot surface. 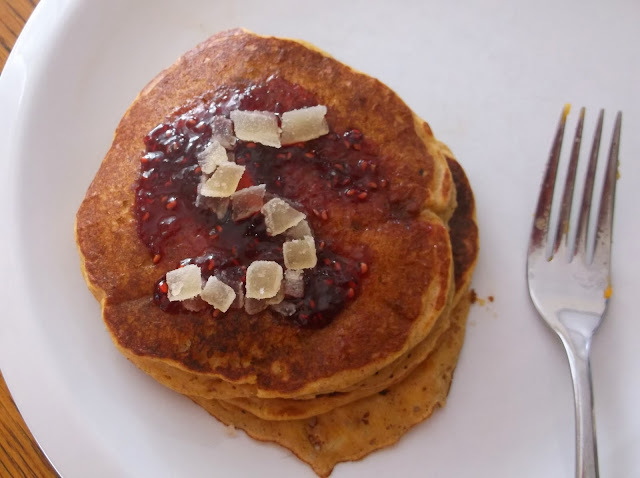 Top with maple syrup, raspberry jam, and of course the crystallized ginger.